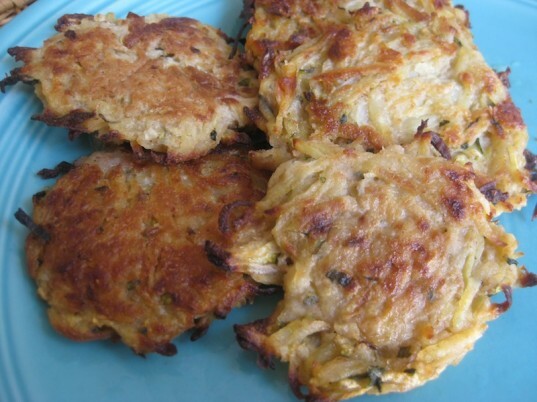 Latkes, or potato pancakes, are the ultimate Hanukkah food. They are tasty, filling, vegetarian-friendly, and...often dripping in oil. While eating fried latkes at Hanukkah is a tradition that certainly deserves to be celebrated once a year without guilt, we thought we'd offer a healthier version that you can indulge in all year long. And since potato pancakes are often a kid-friendly favorite, we're guessing your little ones will be excited about this recipe as well. We've adapted a baked latke recipe from bloggers Meet the Shannons (makers of these amazing vegan Tagalongs) to include zucchini, making the recipe even more veggie-licious and healthy. 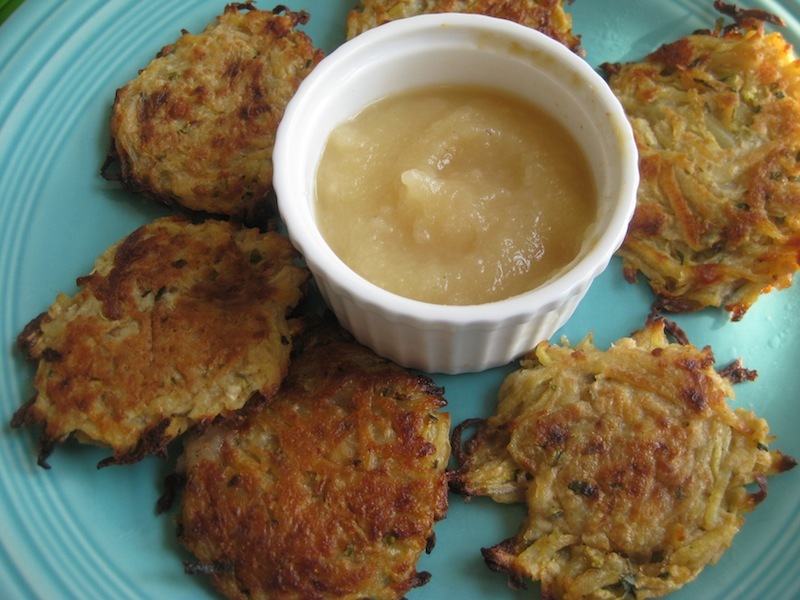 So whether you are actually going to be lighting Hanukkah candles or not, make a batch of these potato pancakes, served alongside some applesauce and vegan sour cream. Your family and their bellies will thank you! 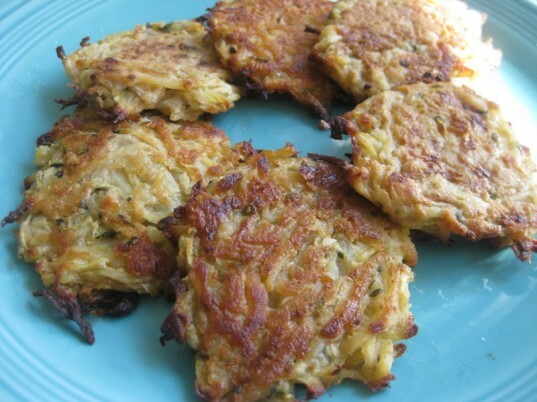 Read on for a hearty yet healthy holiday latke recipe or find one-page, printable directions here. 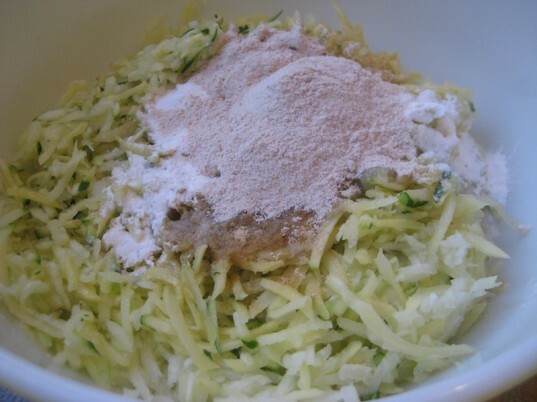 Grate the potatoes, zucchini, and onion using a box grater or (much easier) the grater attachment of a food processor. 3. Squeeze out the excess liquid. Do NOT skip this step. Transfer the grated veggies into a colander (I used a fine mesh one) and press/squeeze/ring out the excess liquid. The mixture doesn’t have to be totally dry, but your latkes will be crispier and will also hold together better with the liquid drained from them. 4 .Mix in the other ingredients. Transfer the veggies to a large bowl and add the flour, salt, applesauce, nutritional yeast, olive oil, and egg replacer. Knead the mixture well with your hands so that the veggies are well coated. Cover one to two baking sheets with parchment paper. Coat lightly with olive oil, spreading to cover the whole sheet. Alternatively, you can lightly spray the parchment paper or the bare baking sheet with olive oil cooking spray. I used the parchment paper because I think it makes flipping the latkes (and clean up) easier. 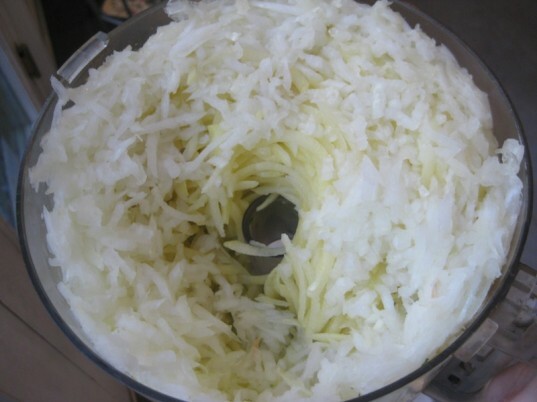 Scoop out rounded tablespoons of the latke mixture on the baking sheet and press down with a spatula to flatten. Baked latkes never seem to get quite as crispy as fried ones, but by keeping them flatter and thinner, you are more likely to get an evenly cooked latke. To make even crispier, you could also try making smaller latkes. This recipe made about 15 medium-sized latkes. Place in the oven and flip every 5-10 minutes (more frequently towards the end) until desired crispness. We cooked ours about 40 minutes. Remove from the oven and serve warm with applesauce, sour cream, and other toppings. Enjoy! Preheat the oven to 450 degrees. 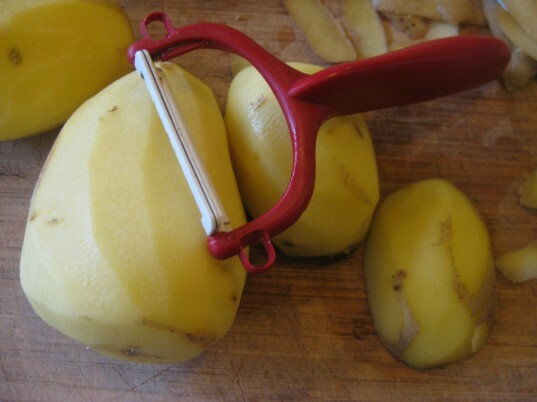 Grate the potatoes, zucchini, and onion using a box grater or (much easier) the grater attachment of a food processor. Transfer the grated veggies into a colander (I used a fine mesh one) and press/squeeze/ring out the excess liquid. Do NOT skip this step. The mixture doesn’t have to be totally dry, but your latkes will be crispier and will also hold together better with the liquid drained from them. Transfer the veggies to a large bowl and add the flour, salt, applesauce, nutritional yeast, olive oil, and egg replacer. Knead the mixture well with your hands so that the veggies are well coated. Cover one to two baking sheets with parchment paper. Coat lightly with olive oil, spreading to cover the whole sheet. Alternatively, you can lightly spray the parchment paper or the bare baking sheet with olive oil cooking spray. I used the parchment paper because I think it makes flipping the latkes (and clean up) easier. 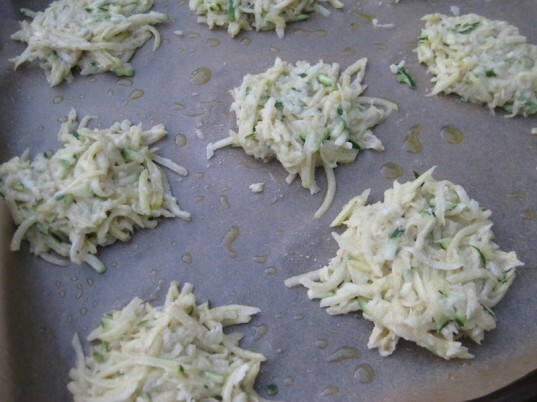 Scoop out rounded tablespoons of the latke mixture on the baking sheet and press down with a spatula to flatten. Baked latkes never seem to get quite as crispy as fried ones, but by keeping them flatter and thinner, you are more likely to get an evenly cooked latke. To make even crispier, you could also try making smaller latkes. This recipe made about 15 medium-sized latkes. Place in the oven and flip every 5-10 minutes (more frequently towards the end) until desired crispness. We cooked ours about 40 minutes. Remove from the oven and serve warm with applesauce, sour cream, and other toppings. Enjoy! Do NOT skip this step. Transfer the grated veggies into a colander (I used a fine mesh one) and press/squeeze/ring out the excess liquid. The mixture doesn't have to be totally dry, but your latkes will be crispier and will also hold together better with the liquid drained from them. For the latkes (recipe adapted from Meet the Shannons): 4 medium-sized yellow potatoes, peeled 1 medium zucchini 1 medium yellow onion 1/4 cup whole wheat flour 1 1/2 tsp salt 1 tsp applesauce 1 1/2 Tbsp nutritional yeast 1 Tbsp olive oil, plus more for coating the baking sheets (or use an olive oil cooking spray for the sheets) 1 Tbsp EnerG egg replacer For serving: Applesauce Vegan Sour Cream Other garnishes such as chopped parsley or roasted beets Preheat the oven to 450 degrees. 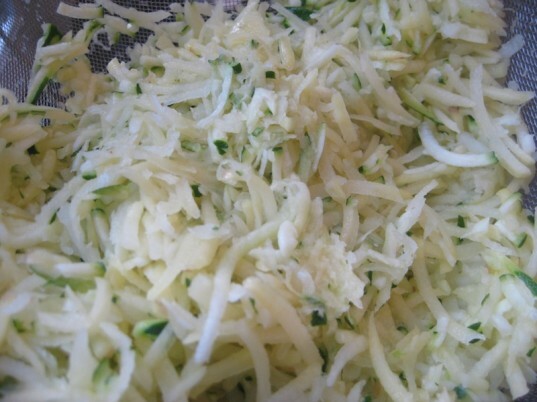 Grate the potatoes, zucchini, and onion using a box grater or (much easier) the grater attachment of a food processor. Transfer the grated veggies into a colander (I used a fine mesh one) and press/squeeze/ring out the excess liquid. Do NOT skip this step. The mixture doesn't have to be totally dry, but your latkes will be crispier and will also hold together better with the liquid drained from them. Transfer the veggies to a large bowl and add the flour, salt, applesauce, nutritional yeast, olive oil, and egg replacer. Knead the mixture well with your hands so that the veggies are well coated.